Strong reliability, accurate to the second: chronographs by Laco.Especially in sport, sometimes it comes down to the exact second. Chronographs by Laco have been made for that exact purpose - made with a love for detail the whole way. Hand-crafted by experienced watchmakers on site in our factory in Pforzheim, chronographs stand for sportiness, elegance and technical sophistication. Strong and precise - these are the chronographs by Laco. Despite a variety of information, Laco designers have succeeded in presenting the time very legibly. Precision in mind with every second. Some models of Laco Chronograph are reminiscent of the Model A of the characteristic aviator watches. Yet all Laco chronographs have one thing in common: compelling functionality. 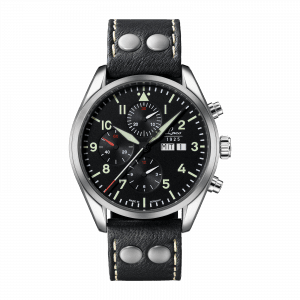 They are characterised by the excellent legibility and undoubted robustness of an aviator watch - in combination with additional functions, for example, the possibility of stopping. Thereby the large central seconds hand counts the seconds of the stopwatch - and the small seconds hand at 9 counts the continued seconds. The additional button next to the crown provides convenient operation of additional functions. 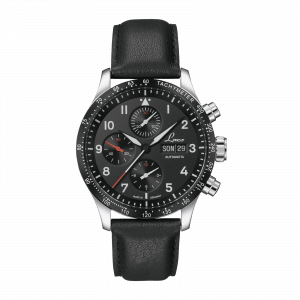 Pure technology: a chronograph like the Montecarlo by Laco, leaves almost nothing to be desired. Day and date display, minute and hour counters and a stop second hand coated with luminous Superluminova C3, and a separate, decentralised second hand: this watch naturally possesses the typical LACO features such as a curved and double-reflective sapphire crystal and 5 ATM water resistance. Also suitable for heavy use in motorsport, Laco chronographs work fantastically at high accelerations and in the face of strong vibrations and shocks. Automatic, robust and precise: ETA 7750.A large part of the Laco chronograph collection can be categorised as "automatic". Automatic watches use gravity and transform arm movements into winding energy.  This means that a torque is exerted on the rotor of the watch by continuous movement. The rotor can often be viewed through a glass at the back of the watch - such as in the Laco Montecarlo, for example. For many models, our experienced watchmakers use the so-called LACO 50. This combination represents yet another abbreviation: ETA 7750 or Valjoux 7750. The Kaliber 7750 is an automatic Swiss movement, which we have used for many years in our high quality chronographs. 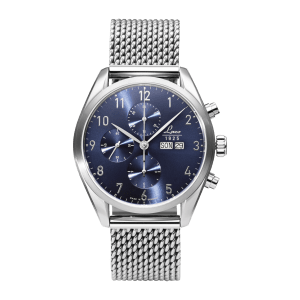 It is well known for its robustness and accuracy and therefore is popular with experienced watchmakers. A few more sentences on the automatic alternative: the quartz movement. At Laco, quartz is used in the Lausanne, Bern, Atlanta, Seattle and Detroit chronographs, amongst others. A quartz movement is characterised by an oscillating unit made of quartz, which allows very high vibrations and is powered by a battery. Since this type of movement consumes little energy, quartz movements are not only cost effective, but also very efficient.